June 17, 2016 By Jessica Giardino & filed under Blog, Sewing Supplies. Looking to give a project a specific shape? Want to make sure that collar stays crisp? You’re in the market for interfacing or stabilizer. These layers rest behind the fabric and are a handy tool for every sewer to master. Achieving professional sewing results can be as easy as choosing the proper interfacing or stabilizer. These two different materials will add shape and secure stitches. This neutral colored material is meant to be permanently added to fabric. Interfacing is either fused in place using an iron or sewn in place. Woven Interfacing: This type comes in various weights and is meant to be used with woven fabric such as cotton. Knit Interfacing: The noted difference of this type of interfacing is that it is actually a knit, therefore it will stretch slightly. Use this type of interfacing when sewing knits. Fusible Fleece: Soft and lofty, this type of interfacing fuses to the fabric. It adds a thick layer to the fabric making it easier to hold a specific shape. Consider using multiple layers of fusible fleece to create an especially rigid shape. Fusible Web: Adhesive on both sides, this type of interfacing is used mostly for appliqué. It is also known as Stitch-Witchery or Heat ’n Bond. Unlike interfacing, stabilizer is created to be removed after stitching. Stabilizer helps reinforce fabric when stitching may damage it. Tear-Away: Very paper-like, this stabilizer works well with lightweight fabric and light stitch work. Wash-Away: This form of stabilizer dissolves in water after stitching. Best used when stitching appliqués or when a bit of stabilizer is needed on the fabric’s right side. Cut-Away: Usually used when working with heavy stitch work, cut-away adds firm support to fabric. How have you used interfacing or stabilizer to enhance your sewing projects? Let us know in the comments! Have something to add? 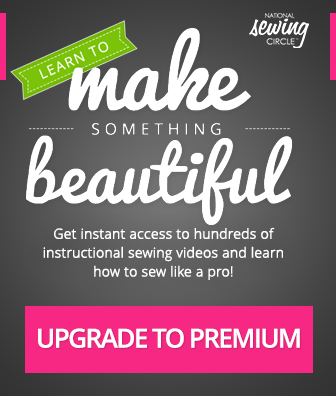 Leave a comment or email editor@nationalsewingcircle.com. I have been sewing & making quilts for about 4 years. I have had difficulty understanding the difference in all the products available. This article has finally clarified the uses and applications in a concise, clear manner. Thanks! I am making a white boucle vest that requires hair canvas or hymo, but the gray color tints the face color of the boucle, giving it a gray tinge. What is an acceptable sew in substitute? Hi, Vivian. Since hair canvas is just a medium to heavy weight fusible woven interfacing, you can substitute any other medium or heavyweight sew in interfacing. These generally come in white and won’t tint the fabric at all. I would cut the hair canvas out minus seam allowances. Now cut a piece of white muslin out in the size the pattern specifies. Zigzag stitch the canvas to the muslin and use that way. This is often done in couture. I can’t think of any other sew in interfacing that would perform like hair canvas. It molds and curves and the potential subs on the market don’t work that way. Good luck. I need to add some stability to a very long banner that I created for our church altar. The fabric is a silk blend and it does not hang straight. I’m thinking about using iron on interfacing on the back side of the banner to give it some stiffness. What do you think? Hi Maria. Fusible interfacing would definitely give the banner stability. If the silk blend is very lightweight you will most likely need a fairly heavyweight interfacing. If you can not find a heavy enough weight of fusible interfacing, you can always use a spray adhesive to attach the interfacing to the back of your banner as well. I am making a quilt using different types of baby clothes. What type of interfacing would be best? You can find this product at many different fabric and craft shops as well as several places online, this is just one of the places you can find it. I am making a basket out of fabric it calls for craft stablizer for bottom and sides interfacing. Why can’t I use interfacing for Botha? You can use interfacing for both if you prefer, however craft stabilizer can sometimes be thicker any heavier than interfacing, which is probably why it is recommend for the bottom. Fusible web is not an interfacing. It is used to bond to fabrics together, not introduce structure to a garment. Fusible fleece can be added to a garment and is usually to provide additional warmth or facilitate a quilted effect. It technically is not interfacing. I can’t even imagine several layers being used in a garment. There are far better products to provide rigidity. I really think there is confusing information here for beginners. Perhaps more information regarding uses in regards to garment making versus crafts. The products I use in my bags I never use in my garment. I’m looking at making a large fedora hat for at the beach. While I want it to be a little floppy I don’t want the whole bill to fall straight down. What would be good for the rigidity in the bill? Thanks to your posting this on pinterest it will the newbys at joanns in training and me helping them . Which of these two do I use on handwoven fabric so that it does not unravel as I try to sew it? This is why I have not, as yet, attempted to cut my handwoven yardage because I don’t know how to keep it from coming apart as I attempt to get the pattern pieces put together. This is my first time trying to make my own clothes with fabric I have made. I am constantly explaining about interfacings and stabalizers and fleeces, etc. to my customers. You have outlined it well. However, I say they are all,stabalizers, i.e. they all provide stability to the fabric. Under that heading we have interfacings (meant to be premanent, tear aways and wash aways (not expected to be permanent), and fleeces ( permanent but soft and adding depth). Thoughts? I am making a log cabin quilt with ties and a teacher suggested using a soft stabilizer before cutting . Can’t remember which one. What do you recommend? I would recommend using a light weight fusible interfacing. 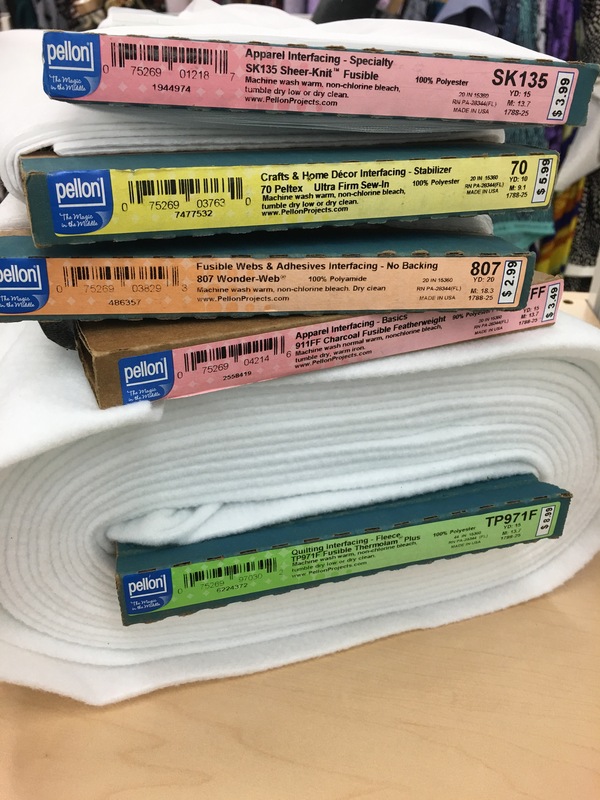 I personally use Pellon brand, as it is easy to find at most craft and fabric stores and works great! Hope this helps! Yes, you can add fusible interfacing to the raw edges. I would recommend doing this and then folding under the raw edge, like a hem, to even further reinforce the edges. I am making a baby quilt with vintage grandma’s garden hexie blocks. I wanted to add some kind of stabilizer to the blocks before I put the quilt together so it would hold up during washes and use. From this article is seems I should use interfacing as it is meant to stay on the fabric. I read an article that recommended using Mistyfuse for “stabilizing” vintage blocks, but I’m not sure that will accomplish what I am needing. I am worried about making it too stiff, does the fusible fleece give a quilted but not stiff feeling? Thank you for help! Yes, fusible fleece will give a soft feel- however because it is fairly thick it could end up feeling stiffer than you would like. I would recommend a light to medium weight fusible interfacing. I am making a fleece hoodie for my 18month granddaughter the problem is the fleece is much thinner than I expected. can I use fusible fleece to thicken it but without a lining? I don’t want to line the whole thing if I don’t need to. Yes, you can add fusible fleece to the wrong sides of all of the pieces prior to sewing them together to avoid sewing an entire lining. The one thing this might do is bulk up your seam allowances more that you want. Consider trimming them fairly close to the seam and then zig zag finishing the seam for extra security.